Whether they're hunting down LeBron's fresh Nike kicks or pricing the leather slip-ons they see on a coworker, shoe shoppers are experiencing micro-moments everywhere, all the time. Here are four insights for savvy retailers so they can be there, be relevant, and win these I-want-to-buy moments. Maybe we should stop referring to shoes as fashion accessories, since they continue to increase their share of our closet space and our clothing budgets. Sneakers alone are a $34 billion business in the U.S., and that figure is growing. Online shopping is playing a big role in that growth by putting the ability to check out new shoes or to buy right now into the hands of shoppers. "Sneakerheads" obsessively scour websites, message boards, and even apps to find the hottest shoe models. But a large share of shoppers will buy on a whim from the store they can get to most quickly. Others will buy online and expect speedy delivery and free returns. Mobile has transformed the way people shop—both online and in-store—into a series of crucial micro-moments that can sway a purchase decision more quickly than ever before. Here are four insights for savvy retailers, including but not limited to footwear marketers, so they can be present and relevant and win the I-want-to-buy moments. In September 2015, there were more than 3X more mobile searches than computer and tablet searches for "Nike Huaraches." Shoppers say a lot with the words they use. They might call a product one thing when looking for information, and another when they're ready to buy. Case in point: Looking at Google data, we found that searches for "sneakers" are most closely associated with searches related to sneaker culture: sneaker brands, release dates, custom kicks, and sneaker communities. Searches for "shoes" are more closely associated with footwear retailers. How people search in those I-want-to-know and I-want-to-buy moments may also be impacted by where they are. We found that searches for "sneakers" were highly concentrated in the Tri-State Area around New York City. 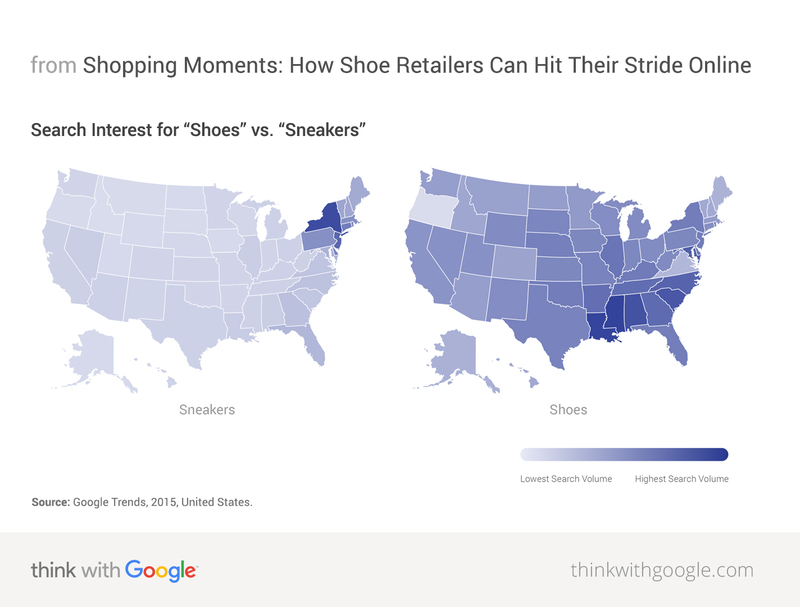 Searches for "shoes," while more equally spread throughout the U.S., had a higher-than-average concentration in the South. Search Interest for "Shoes" vs. "Sneakers"
Source: Google Trends, 2015, United States. This kind of search behavior is indicative of the rise of sneaker culture. Jason Lee, 37, a self-described sneaker aficionado from New York City, says that shopping for shoes and shopping for sneakers are two wildly different experiences. "With sneakers, I'm casually researching limited releases for weeks or sometimes months. I'm deciding what to buy, when and where to buy it, by reading reviews and checking out manufacturer sites," he says. "But if I'm just looking for a pair of basic running shoes or something that meets a tangible need, I'll buy immediately." This data is now available for any retailer to see with our Shopping Insights tool, which shows what products are rising in popularity in your area and allows you to use that insight to promote local inventory accordingly. It also shows shopping trends by city and compares how consumers search for products on mobile and desktop. 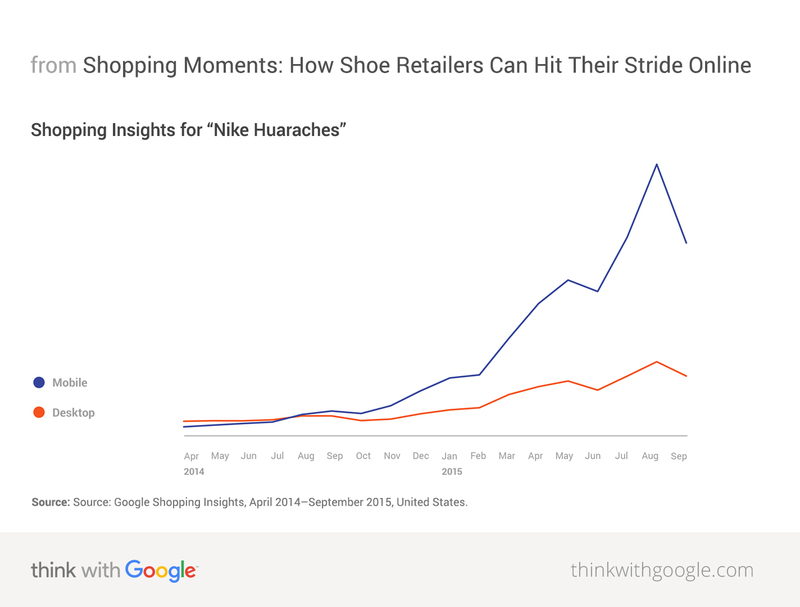 Shopping Insights for "Nike Huaraches"
Source: Google Shopping Insights, April 2014–September 2015, United States. Even less-than-legit shoes can drive category interest, albeit in a snarky way. This summer's wildly popular "What are those?" meme started as a joke: Someone posted a short video questioning the coolness of someone else's shoes, ending with a quick pan down to the subject's footwear as the jokester shouted his now-infamous question. The video quickly became a pop-culture phenomenon, garnering millions of views on YouTube. And then there are the many knock-off videos that have gotten millions of views themselves. Call them what you will, there's a certain pride in the ownership of shoes or sneakers. We see this in the after-purchase searches of buyers who hope to keep their footwear looking deadstock—that is, never worn. According to Google data, search interest in cleaning sneakers was up 1.5X this August (YoY), and six of the top ten questions people had about shoes were related to cleaning (as were four of the top five for sneakers).4 While branded content addressing this question remains scarce (hint hint), dozens of user-generated videos posted by individuals are filling the gaps. Many have topped 100K views on YouTube, and a handful are nearing 1M. These kinds of after-purchase video micro-moments are often-untapped opportunities for shoe brands and retailers. Searches related to "how to" on YouTube are growing 70% YoY. Those brands that identify these moments, which are both useful and relevant, win them. Retailers who understand these micro-moments can better connect with shoppers and drive sales. Here are some ways you can be there and be relevant in their I-want-to-buy moments. How do people search for your product? As we saw with "sneakers" vs. "shoes," it depends on their intent. In your search campaigns, bid on the terms most relevant to your offering and goals. What are people shopping for right now? Keep up with real-time and regional trends with our Shopping Insights tool. With this intel, a shoe marketer could see that searches for red sneakers are spiking in the northeast, study up on what is causing the spike, and take action to increase stock, create promotions, or craft clever creative while a trend is still happening. What videos are people watching about your product? When it comes to shoes, unboxing videos, sports highlights, product-hype reels, and even memes can connect people with brands, so be sure to be there with content and ads when those views happen. What questions are people asking about your products? Before, during, and after purchase, questions come up. Create and promote content that can provide answers and win the respect of current and future customers. Want more on putting micro-moments at the heart of your strategy? See all of Google's latest research and case studies in "Micro-Moments: Your Guide to Winning Mobile." 1 Google Shopping Insights, September 2015, United States. 2 Google Data, August 2014 and August 2015, United States. Aggregated anonymized internal data from a sample of U.S. users that have turned on Location History. Queries were considered as being "from" a location if they occurred within one hour of a user visit to a shoe store. September 2015 vs. September 2014. 3 Google Data, April 2014 and April 2015, United States. Classification was based on public data, such as headlines and tags, and may not account for every type of review video available on YouTube. 4 Google Data, January–August 2015, United States.